We’re back again at our lovely local festival: WOOD Festival! The plant fibres workshop was very popular, preparing flax, nettle and other fibres ready for spinning, into thread and weaving into cloth. Many people made their own nettle string to take home. 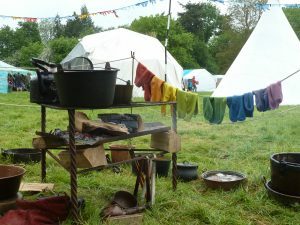 We were also spinning yarn(s), weaving all kinds of magic (including 2:1 twill on the warp weighted loom) and dyeing socks every colour of the rainbow. 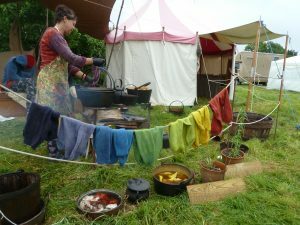 New dyes from the festival field were used, including nettles and burdock, and bracken collected from welsh hills. 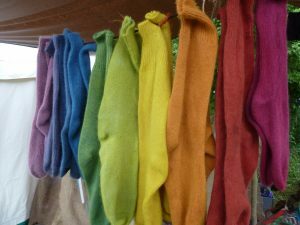 These dyes make beautifully soft greens, yellows, greys and browns. Highlights of the festival were the harmony singing workshop led by Katy Rose Bennett, food from Taste Tibet and music from the Owiny Sigoma Band, and Sam Lee & Friends. We don’t get out of our workshop tents much during the day but really enjoyed everything we heard drifing over from the main WOOD stage! See you again next year, WOOD Fest! 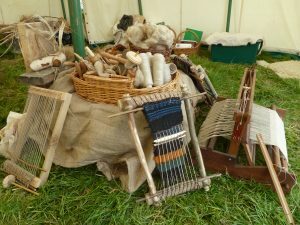 This entry was posted in Blog, Events and tagged braken, burdock, dyeing, festival, flax, hemp, nettle, oxford, oxfordshire, socks, spinning, string, weaving, wood, wood fest, wood festival, wool on 23/05/2016 by admin.